Advertising and design legend Paul Arden takes an exciting, visually creative, and thoroughly digestible approach to a subject of enormous proven interest and relevance. 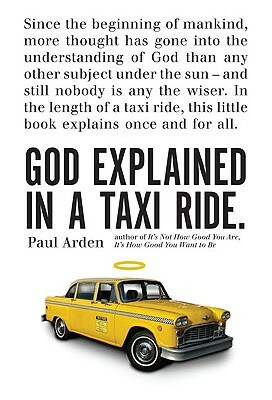 Using a series of poignant, contemporary vignettes, God Explained in a Taxi Ride analyzes and explores the questions that have persisted since mankind's earliest days. This brilliant little gem of a book compels readers to scratch their heads as it examines man's relationship to the divine--all within the length of a taxi ride.